Marshes of Glynn was exhibited in DRAW 17, the 96th annual open exhibition of the Society of Graphic Fine Art - The Drawing Society at the Menier Gallery, London in 2017. 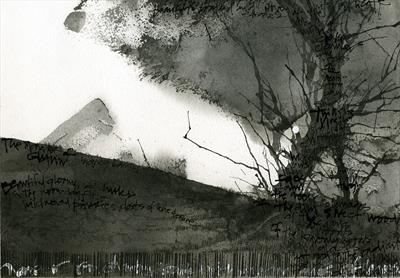 This drawing continues a series in ink that incorporates handwriting and poetry. The series began with two drawings of anti-war poems by the Polish Nobel prize winning poet Wisława Szymborska. The Marshes of Glynn, by contrast, is a poem about a coastal landscape in the American South. The poet is Sidney Lanier, who fought in the Civil War for the Confederates.